There, has of yet, no reason given, just a phone call to tell me it’s off. They have said my account has been credited the 2 track days I had “bought” but that doesn’t stop it being rather annoying. Spike was understanding, and will be available to do another day, so that is just postponed, and is sending me a copy of his DVD so I can gain some of his knowledge before I race at Cadwell in 2 weeks time (Sorry Sarah, you may be seeing this quiet a lot over the next few weeks). I understand they have also cancelled Snetterton on Monday, a track I have never been too and isn’t on the NG calendar. I am as you may have guesses a bit disappointed, and I would go so far as to say annoyed. The van was all packed and ready to set off later tonight. That took a lot of effort. I have my new generator (£296 which I paid for next day delivery for, £25), which is somewhat larger than the one it replaced and I had to figure out a way of transporting the awning frame without it being a javelin when I braked. 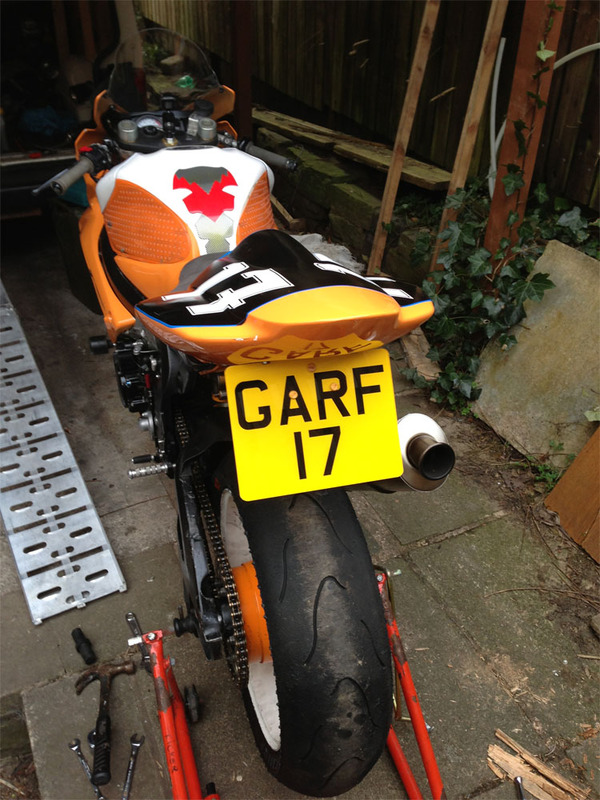 I also put on my new number plate so I didn’t have yo go through the hassles of cleaning the old one of sticky, gaffer tape residue for the MOT next year. It appears that EasyTrack has gone into liquidation, 48 hours too soon for my liking, but seriously hope all those effected don’t loose out too much. Terrible thing to loose your jobs, especially such a great group of people. I hope someone steps in and saves this good company.